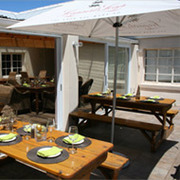 Oyster Bay Lodge is the perfect destination for intimate functions. We specialize in small private weddings on a private, desolated beachfront using horses as a beautiful backdrop. News about the lodge and the area. Updated quarterly. Why choose Oyster Bay Lodge? Oyster Bay Lodge is a 4 star luxury lodge. Situated on a natural coastal reserve between Knysna and Port Elizabeth, along the malaria-free Garden Route in South Africa. The luxurious accommodation consists of 4 Luxury ‘Cape Dutch’ Chalets and 10 Comfortable Guest Rooms with optional services. There are exciting activities and adventures on the property and the surrounding area.